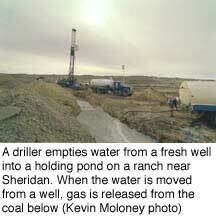 A driller empties water from a fresh well into a holdingpond on a ranch near Sheridan. When the water is moved from a well,gas is released from the coal below. Note: this story is accompanied by the essay "Welcome to (your name here), Wyoming," as well as several shorter sidebar articles, all available online in the "Sidebars" section of this issue. SHERIDAN, Wyo. - Buck Brannaman is an angry man. The world-traveling horse trainer sits on a chestnut quarter horse in an indoor arena. Behind him, students quietly practice their riding skills. Brannaman, who modestly admits he was the inspiration for Nicholas Evans' novel and later the movie The Horse Whisperer, does not mince words. His gray eyes are smoldering. "I am the poster child for torn-up ranches," he says bitterly. The cause of his anger is apparent over the hill behind the arena. A 600-acre draw has been ripped up by earth-moving machines. Small reservoirs have been bulldozed into the creek bottom and a half-dozen drill pads carved out of the surrounding hillsides, each big enough to allow a tractor-trailer rig to turn around. Several gas wellheads jut out of the ground, but none of the wells is producing. At one, fencing falls into an unfilled drilling spoil pit. Nearby, lengths of pipe rust on a staging pad cut out of the pasture. Roads run haphazardly across the sere, grassy slopes. The reason for all this is coalbed methane, a form of natural gas that can be cheaply and easily extracted from coal-rich landscapes such as northeastern Wyoming's Powder River Basin. 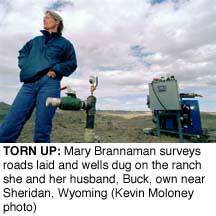 Although Brannaman and his wife, Mary, own the surface rights to this ranch, they do not own the rights to the minerals underneath, and they, like many of their neighbors, are at the mercy of energy markets hungry for natural gas. This boom, fueled by Wyoming's lax state regulations and enthusiasm for energy revenues, could be bigger than anything the region has ever seen. It is throwing a net of industrial development over country that until now has been wide-open and empty. It is an experiment not just on the environment, but on the society and economy here. "I didn't have this place given to me," says Brannaman, who has sued the drilling company that he claims has abandoned its work on his property. "I worked for every damn dime, riding some of the most difficult horses in the world and eating bad food on the road. I've given up my body and my health for this place." So far, says Brannaman, his legal fees and lost income amount to $180,000, and he's running out of patience. Pointing to tree-sitter Julia Butterfly Hill's success at protecting an old-growth forest grove in California, Brannaman says, "If it takes bringing 200 environmentalists into town and having them live in tents on my creek, I'll do it. I've never been one for siding with the wackos, but things change when you're protecting your home." Bigger than Vermont and New Hampshire combined, the 20,000-square-mile Powder River Basin spreads east from the Bighorn Mountains to Thunder Basin National Grassland and laps north across the border into Montana. The entire basin is underlaid by multiple coal seams in the rough shape of a bowl. In the center, around the broken hills of the Powder River Breaks, the seams are 1,200 feet deep, and they join to form a massive underground coal deposit known as Big George. The landscape slowly smooths out as you drive east from the Powder River, at first resembling hundreds of huge bread loaves huddled together, then easing down into the long, rolling grasslands around Gillette. Here, along the eastern edge of the basin, large strip mines pock the land. The coal mines, opened during the 1970s, brought the first large-scale energy bonanza to the region. Commercial coalbed methane technology dates to the late 1980s, when drillers sank relatively shallow 350- to 1,200-foot-deep wells in the Black Warrior Basin in Alabama and the San Juan Basin in southern Colorado. But in northeastern Wyoming, gigantic coal reserves and skyrocketing demand combined over the past two years to ignite the first big coalbed methane boom. 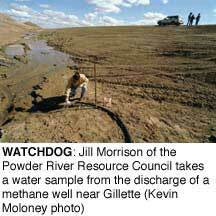 Geologists have sharply upgraded their estimates of recoverable coalbed methane in the Powder River Basin in recent years, to as many as 39 trillion cubic feet, or more than a year's gas supply for the entire nation. The deregulating electricity industry, in its search for fast and flexible power sources, is battling to get at this massive amount of methane. While coal-fired plants can take a decade to plan and construct, natural-gas fired plants - often no more than aircraft turbines mounted on concrete pads - can be put up in months. This demand has helped to push up gas prices. An average coalbed methane well produces 100,000 cubic feet of gas each day, worth between $1,200 and $10,000 during the past year, depending on market price. Industry analysts say the cost of finding and developing coalbed methane ranges from 20 cents to 40 cents per thousand cubic feet, about one-third the cost of traditional deep-well natural gas. Coalbed methane companies, one analyst declares, are "just beautiful economically." Not everyone is so thrilled. "We're playing God with the environment," says Walter Merschat, president of Scientific Geochemical Services in Casper and a critic of the haphazard approach to coalbed methane development in Wyoming. "This is shooting yourself in the foot with both barrels." 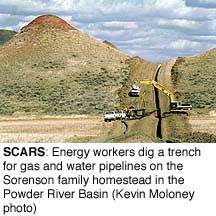 As of mid-August 2001, private companies had drilled 10,538 coalbed methane wells in the Powder River Basin, but the Bureau of Land Management's projection is that industry may sink 80,000 wells here by 2010. Eventually, up to 139,000 wells, one every 80 acres, could essentially cover the entire basin. Coalbed methane critics recite a litany of problems with the technology. Drilling a coalbed methane well typically disturbs four acres on each 80-acre parcel. Noisy well pumps and compressor stations spew nitrous oxide and other pollutants into the air, and Wyoming officials acknowledge that many of these emissions are unregulated and may violate air quality standards. Heavy vehicle traffic damages roads and throws up dust. The biggest headache for many landowners is water disposal. Just as popping the top on a can of cola frees the dissolved carbon dioxide, pumping water from a coal seam to the surface frees the methane from the ground (HCN, 9/25/00: Colliding forces: Has Colorado's oil and gas industry met its match?). As of last March, well operators in the basin were pumping 1.85 billion gallons of water to the surface every day, causing an ironic problem: how to dispose of water in an arid landscape. In many places, the wastewater contains dissolved sodium, calcium and magnesium, and cannot be used for irrigation or dumped in waterways. In Colorado, coalbed methane water is reinjected into deep strata, but in Wyoming, state law does not require reinjection, and some coalbed methane operations have flooded hay meadows and killed trees. Other operators build reservoirs on private ranchland. Once coal deposits are dewatered, says Merschat, gas migrates toward the surface in any direction it can, not just up well bores. It is odorless, colorless, tasteless. It can accumulate in buildings. The potential result? "Boom!" says Merschat, throwing up his hands.